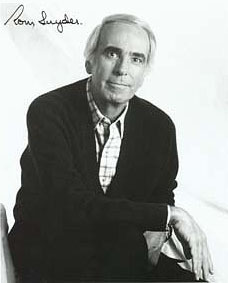 Erudite and easy-going TV talker Tom Snyder started as a local radio reporter in Milwaukee. He then moved to TV news, and eventually anchored local newscasts in Philadelphia and, later, Los Angeles. From 1973-82 he hosted The Tomorrow Show on NBC, following The Tonight Show in the wee hours on weekday mornings. It was one hour long, usually with just one guest, and Snyder asked interesting questions and offered irrelevant but amusing asides. He was always smoking on camera, so clouds of tobacco fumes floated around his head like a snazzy special effect. Snyder's most memorable interviews included Ayn Rand, John Lennon, Charles Manson, and Johnny Rotten, who was fabulously disinterested and probably high. Snyder's gray hair and thoughtful manner got the boot when NBC went for youth, replacing Tomorrow with David Letterman's Late Night in 1982. Snyder then hosted a long-running show on ABC Radio, and later a TV show on CNBC. He returned to his familiar TV time slot on CBS with The Late, Late Show from 1995 to 1998, following Letterman's Late Show. Letterman was a big Snyder fan and owns The Late, Late Show, but CBS wanted younger viewers too, and so in 1998 he was replaced by ex-Daily Show host Craig Kilborn. Snyder was a model train hobbyist, as documented in Celebrity Train Layouts II: Tom Snyder. Backstage on Doug Henning's World of Magic, he was once chased into the men's room by a tiger. In 2005 he was diagnosed with leukemia and he succumbed to the disease on July 29th, 2007.